2. Combine pepper, paprika, breadcrumbs, parsley and canola oil in a small bowl. 3. Spread mixture on a piece of waxed paper longer than tenderloin. 4. Trim the fat and skin from the tenderloin and tie with kitchen string. 5. 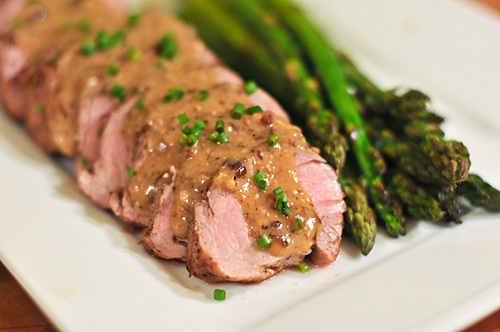 Brush the tenderloin with 1/4 cup mustard, then roll in spice mixture to coat. 6. Insert meat thermometer into middle of the tenderloin and place on a roasting rack. 7. Cook 30 to 45 minutes, until thermometer registers 145° F for beef or 160° F for pork. 8. Let meat rest 10 to 15 minutes then slice into 12 portions. 9. To make sauce, heat remaining 1/4 cup mustard, horseradish and brown sugar in a small pan over medium heat. 10. Cook and stir for 3 minutes. 11. Reduce heat to low and stir in sour cream. 12.Remove from heat and serve over tenderloin.